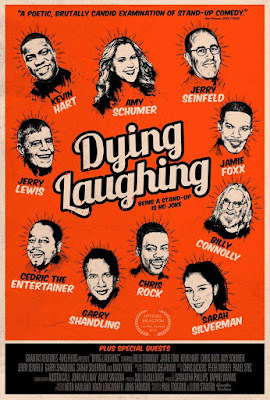 Dying Laughing is documentary that tries to find out just what makes a stand up comedian do what they do. Stand-up comedy, as presented here, is sheer hell. A gut-wrenching, life-ruining experience that chews up the weak and leaves even the strongest broken and alone. Or maybe it is life-affirming and invigorating? An endorphin and serotonin speedball that gives just as much as it takes from the hapless junkies who crave it so much they will soak up abuse from a crowd of drunks just to get a fix. Dying Laughing remains neutral, allowing its interviewees to tell it their way. As the film cuts between talking head after talking head, the danger is that Dying Laughing will become a long-form edition of one of those “I Love... Stand-Up Comedy” clip shows. That it doesn’t is largely down to the quality of those talking heads, who include Comedy megastars like Jerry Seinfeld, Sarah Silverman and Jamie Foxx as well as less well known but established acts like Jim Jefferies, Cocoa Brown and Paul Provenza. There is also a sizable UK contingent, including Billy Connolly, Lee Mack, Victoria Wood, Stewart Lee and Eddie Izzard. Almost all are engaging, funny (I mean, you’d hope) and have real insight into what it means to stand up in front of an audience and just ... say stuff. The weirdness of doing stand-up as a job and the soul-gouging experience of ‘dying’ in front of a crowd forms the bulk of the film. 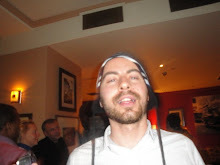 Stand-up and TV writer Royale Watkins - he co-wrote the TV series based on Are We There Yet? (2005) - is in tears as he recounts the nightmare of dying onstage in front of his idol, basketball legend Michael Jordan. Other comics spin tales of fistfights breaking out between audience members or the stone cold heckles that triggered panic attacks verging on out of body experiences. Performing comedy, Jerry Seinfeld tells us, is purely down to the comedian’s ability to withstand torture. But for all the horror stories, the loneliness of touring and the desperate straits most comics find themselves in while coming up (“peeling your face off a vinyl surface minutes before going on stage” as Frankie Boyle puts it) most of the interviews are positive and enthusiastic. Jerry Lewis is notorious for his disdain and wilful destruction of unprepared interviewers but here he is open and happy to talk shop about the job he loves. In what was either a stylistic or budgetary constraint there are practically no clips of actual comedy performances. We get to see a few snatches of audience reaction to a blurred and largely unheard act, the odd establishing shot of a comedy venue but then it's straight back to business. Each comic shot in an unflattering, silvered monochrome that draws an interesting contrast between on and off-stage, but has the unfortunate effect of turning skin into dough. Despite the lack of actual jokes, having funny boned subjects means that even the most banal anecdote about dining alone in a strange town or scribbling gags in a notebook is delivered with panache. Many of the comedians here are at the top of their game financially as well as comedically but their comic instincts mean things never get too backslappy and the filmmakers resist the temptation to go for an obvious ‘tears of a clown’ narrative even when faced with what are often quite dark stories. 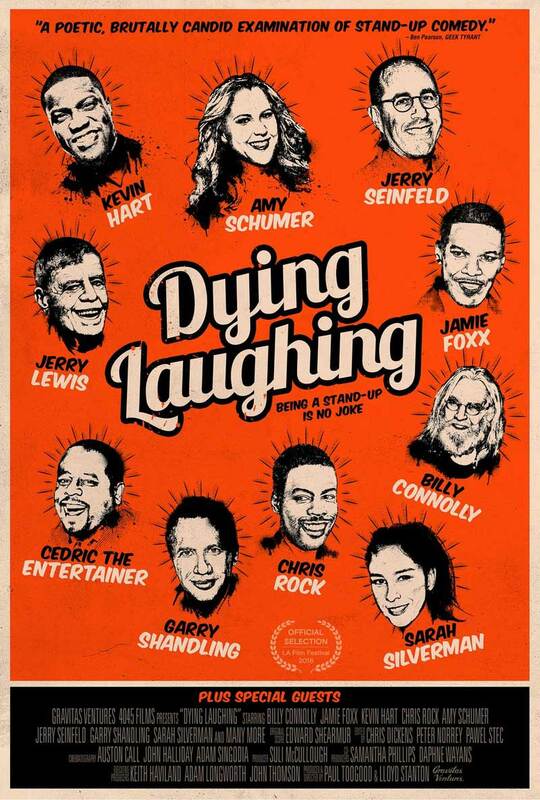 Engaging, interesting and often very funny, Dying Laughing offers real insight into its subject. Maybe not one to schlep to the cinema for but when this inevitably pops up at 11PM on BBC4, you won’t regret staying up.